Adified is a Laravel powered PHP classified scripts comes with a lot of advanced features to help you grow your classified website that can serve millions of users at a time. 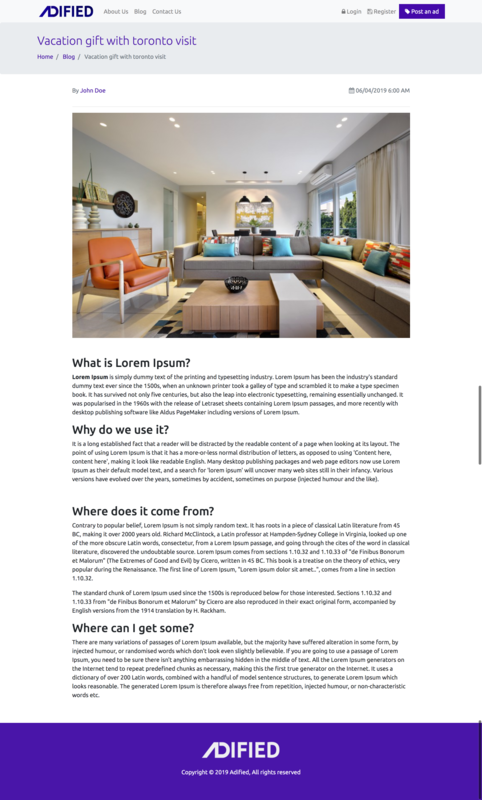 This is an extremely powerful classified script has a clean and modern designed theme to show ads properly. The simple but rich admin panel wrapping all of the admin powers that can manage your website properly. Such as blocking a user, delete ads, change the ad posting price, check the payment transaction, upload media files, approved newly added ads with a lot of admin actions. Media Manager: Adified has a media manager to upload instantly any image to ads without the hassle and it saves all of the media that has been uploaded previously, so you no need to repeat a file upload. just upload once and use it every time you want. SEO and Microdata friendly: A classified website is not only about just developing and live. You need to make sure that users can find your website easily by a search over Google, Bing, Yandex or Yahoo. We did this job nicely and Adified is fully searching engine friendly, the data which available for visitors will be found in very short time by these search engine. So you no need to worry about this. Fully Responsive: At these days, 65% of visitors comes from smartphone, tabs or others small device, Adified – premium classified scripts support all of the devices that exist in the world. It will fit every screen. Premium / Urgent Ads: This money maker features made Adified classified application more elegant, a website holder can make money easily by allowing his visitors to post premium / urgent ads by paying money. Report Ads: Not every user is good or legit, some evil can post offensive ads, others users can report any ads if they found any violence or something wrong at ads or it’s information, as an admin, you can easily remove these ads from your website easily by using Report Ads feature which comes built-in with Adified premium classified ads application. 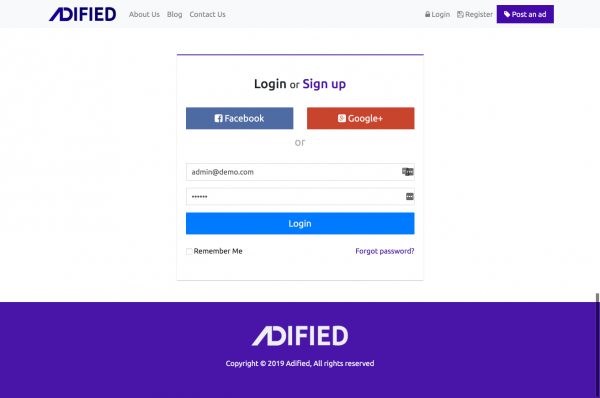 Social Login: Your lazy users can get logged in easily to your classified website by using Social Login feature, you need to just set social login settings to run it immediately. 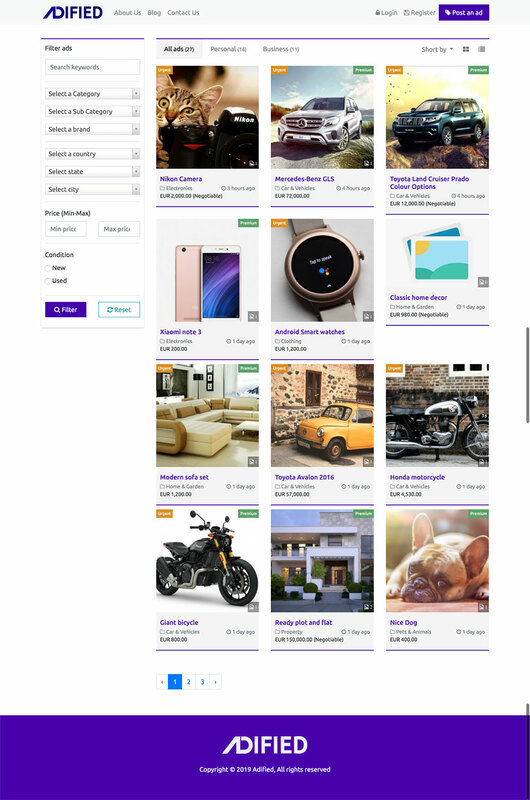 Seller Page: personalized seller page will show you all of the ads belong to a specific user by browsing his profile page from any ads. It will work also as listing store product. Payment History: All of the payment transaction and history will be saved to your database, admin can check or track any transaction from the admin panel. Contact US Page: dedicated contact us page has a contact form and a place to show google map if you are interested to show your office location or getting messages from your users. 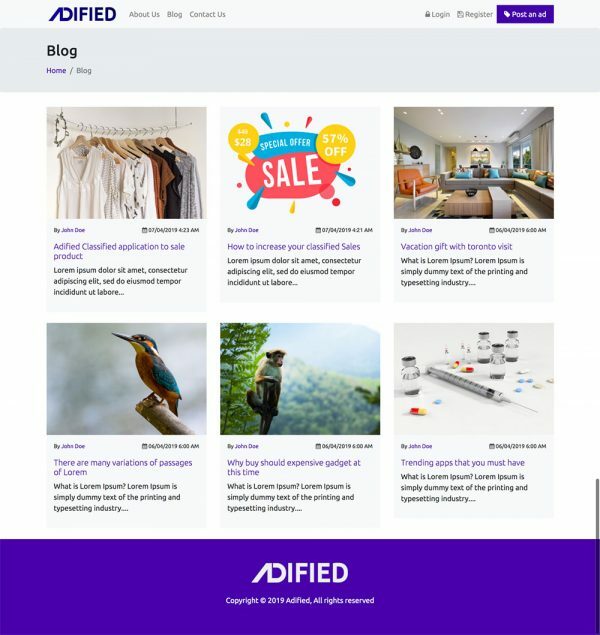 List and Grid View: Adified PHP classified script has list and grid view mode for all of ad listing page, such as searching an ads, or searching by cities, searching by the seller, etc. A lot of more features exists in Adified classified script, they waiting to discover them by you.